Well here I am back out on the road again to continue my voyage of discovery round the coast of South Africa and have just discovered that there was still 1 post I needed to do to complete my trip down the West coast so here it is. 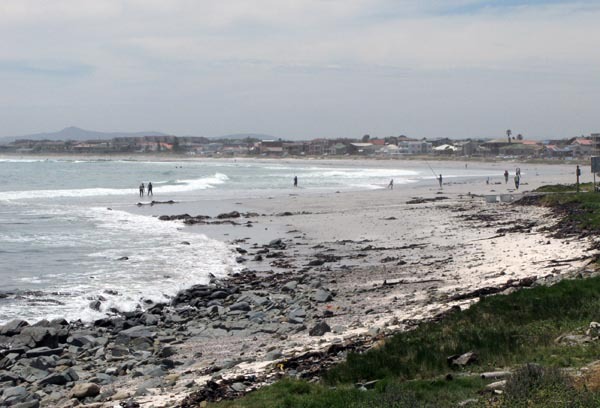 Melkbosstrand still has an old established feel to it. 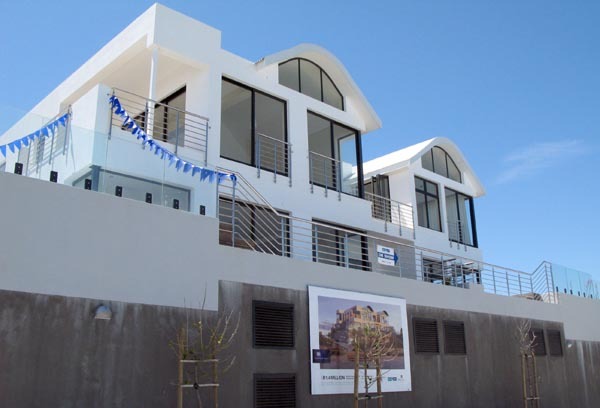 There are modern shops and some pretty upmarket looking houses but overall it has not really been developed to the extent of such as places as Big Bay just 10 km’s down the road towards Cape Town. As usual I am going to let my photographs do most of the talking. One of the more modern houses next to the beach. The beach front which offers safe bathing and apparently good fishing. 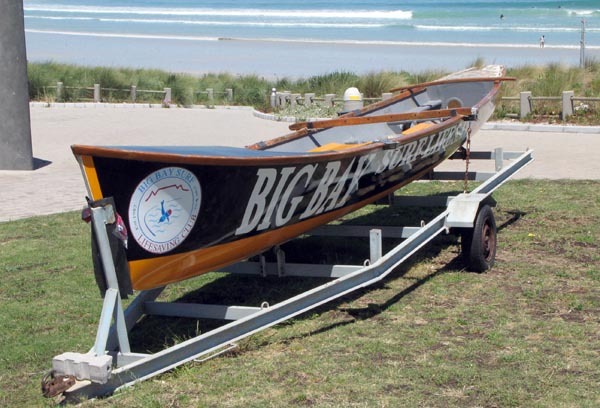 As one leaves Melkbosstrand and travels towards Cape Town you drive along next to undeveloped beaches, where I saw quite a few fishermen with lines in the water, you have to ask yours self how long will it last and especially as you arrive at Big Bay. 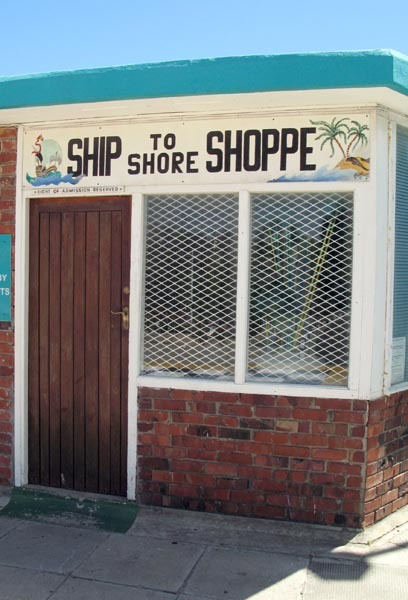 I first went to big bay about 40 years ago and there was pretty much nothing there apart from a parking area, a small shop and not much else. 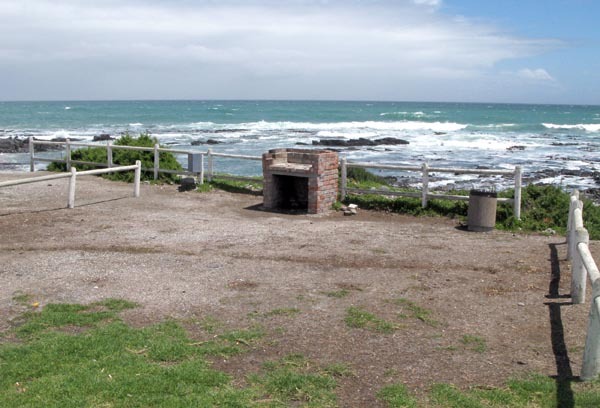 It was a very popular spot for surfing in those days and also a great place to go to for a braai (BBQ) above the road in the picnic area or at the beach. Wow has it all changed over the years. It is now a massive sprawling mass of houses, developments and shops and apart from the actual beach area is not recognisable. Big contingent of life guards there – not to mention the “car” guards. One of the shopping centres where there just used to be one small shop. 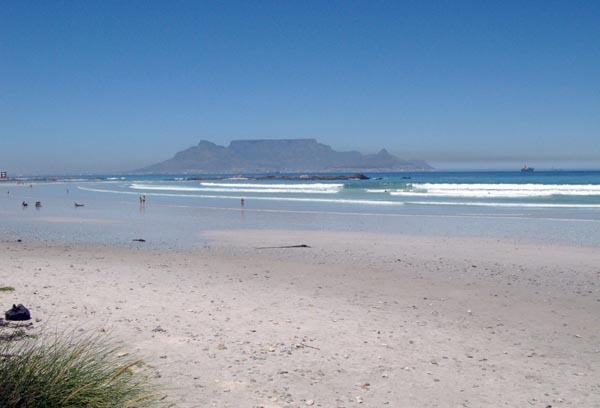 Big Bay with Table Mountain in the background. 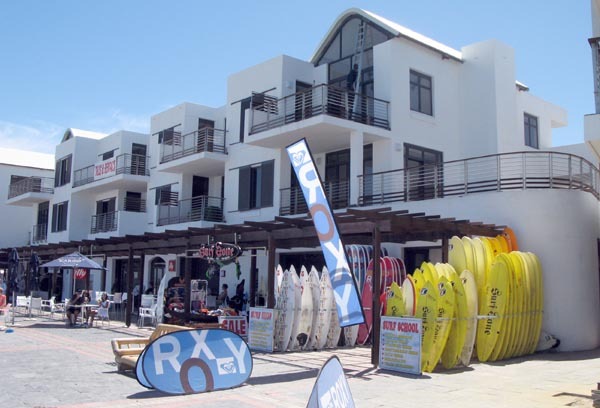 You can still buy on the beach at Big Bay but it is going to cost you big time. 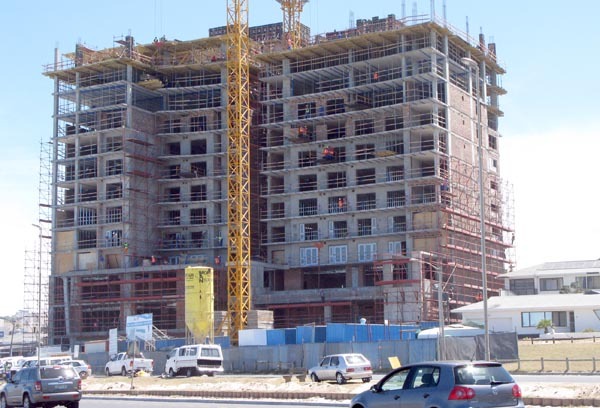 One of the developments next to the beach. One of the developments in the area we used to picnic in years ago. 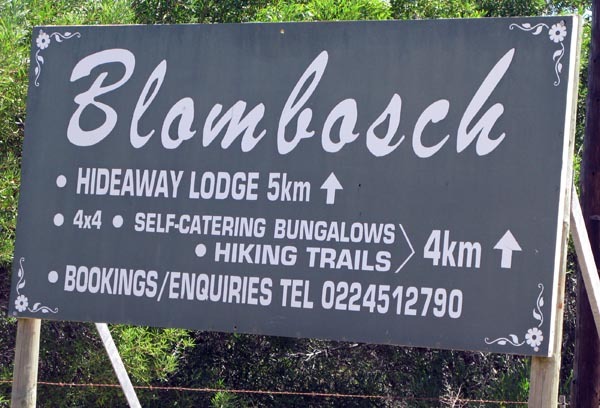 Moving on a bit closer to Cape Town is Blaauwberg. It was a place I used to visit frequently as I had friends that lived there. 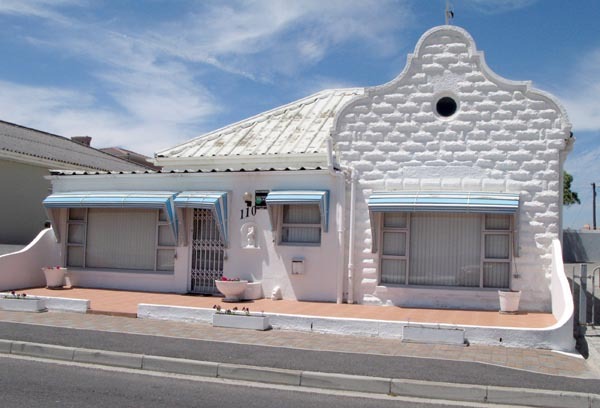 Looking at Blaauwberg today, while there has been growth and quite a lot of change, it has still somehow kept its character of the past. 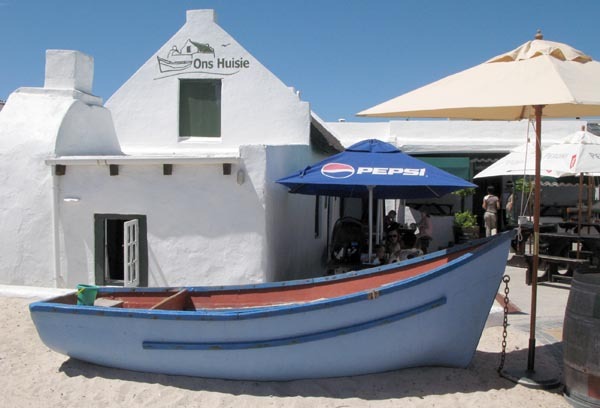 “Ons Huisie” restaurant is one of the most famous attractions of Blaauwberg. 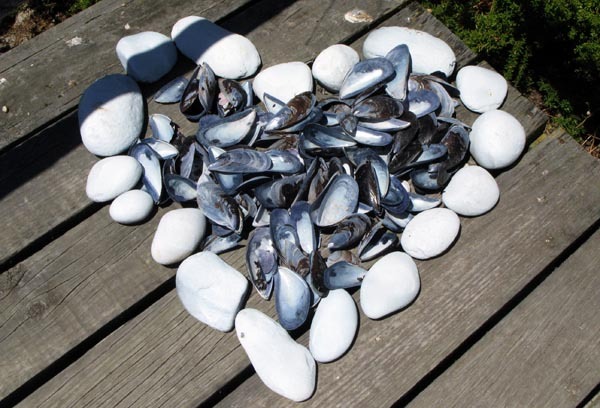 Great sea food. Another well known attraction in the area. I remember, years ago, going to some great “dinner dances” here. The old place is looking really good these days and also has great sea food. A reminder that the sea can be a dangerous place. An hotel going up right on the beach front. 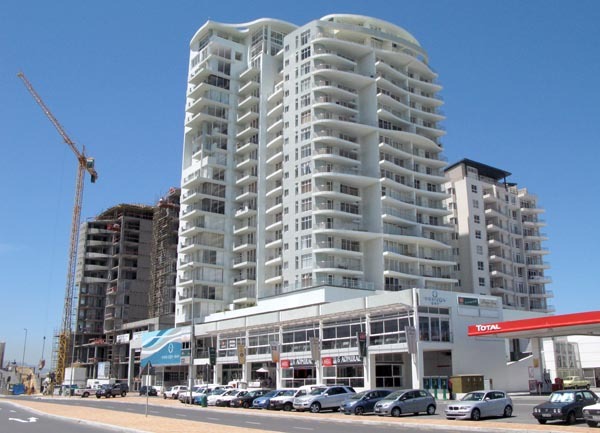 Some of the older and new developments along the beach front. 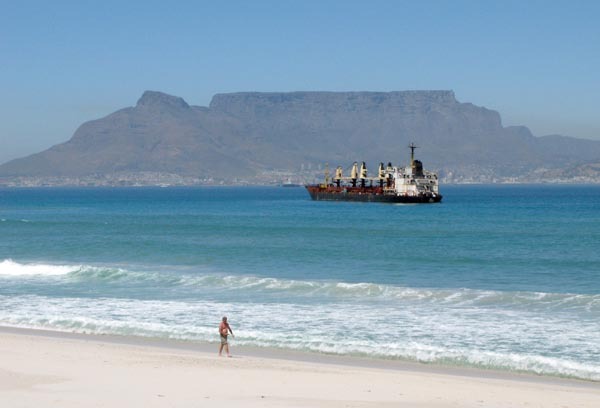 A final shot from Table View of Table Mountain and the wreck of the bulk carrier Seli 1 which went aground just off Table View beach in a gale on the 8th September 2009. Well, sadly, (for me anyway) that is the last of my posts on the West Coast of South Africa and I have now just started on my journey up the Western Cape south coast. 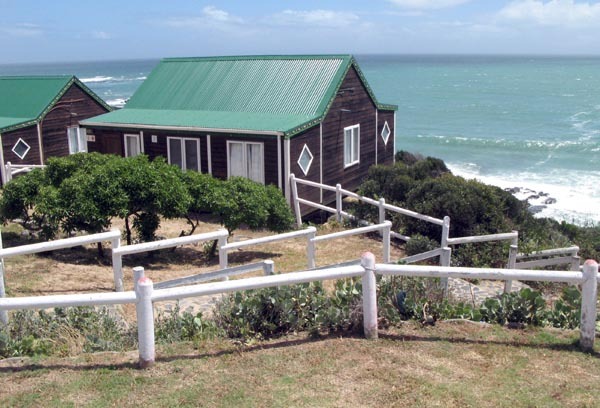 I am at the moment staying in the Strand / Gordons Bay area and am going to slowly make my way up the coast to such places as Rooi Els, Hangklip and other small towns as I move toward Hermanus. I hope that many of you who have been following my travels up to now will continue you to do so in the future. I love getting feedback and comments and watching the number of visitors to the site grow by the month. In fact I have been staggered by the numbers as I thought, when I started out, that it might be looked at occasionally by family and friends, but I have been getting visitors from all over the world in ever increasing numbers. See you on the other side of Cape Town. 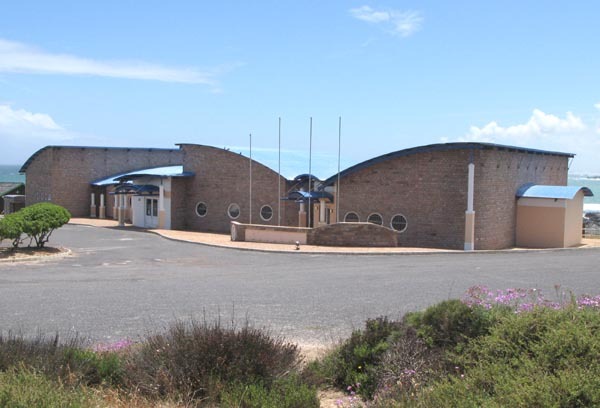 When I left Yzerfontein I was still unsure as where my next stop would be. I had driven down and had a look at Ganzekraal and found it to be not to bad but that there was very little shelter or shade from the wind and sun. 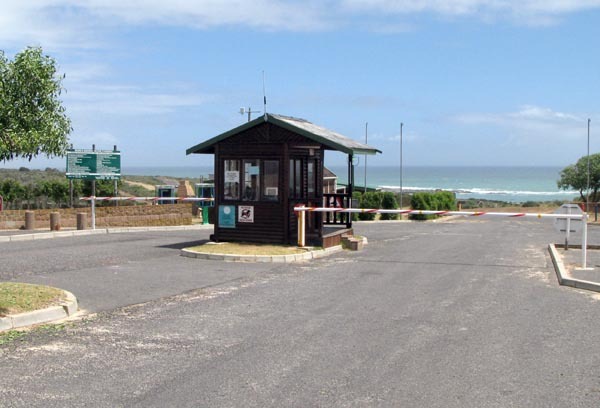 By the time I was at the turn off to the park the day was really hot and a strong South Easter was blowing so I decided to give it a miss and go straight to Ou Skip in Melkbosstrand. 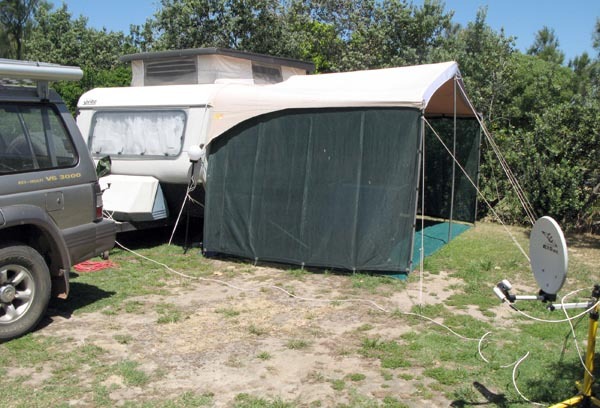 Ou Skip Caravan Park in Melkbosstrand. 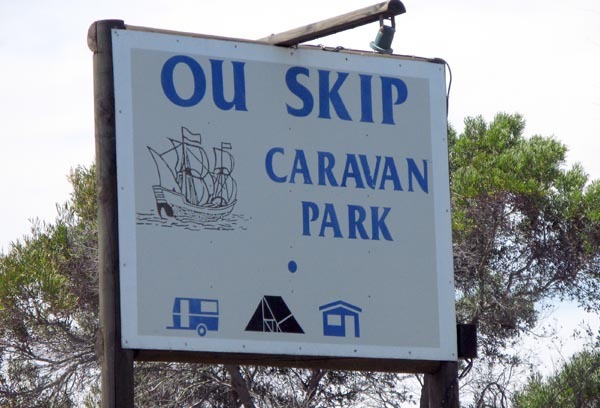 Ou Skip is graded by the SA Grading Council as a 3 star resort and is one of the largest caravan parks in the Western Cape. 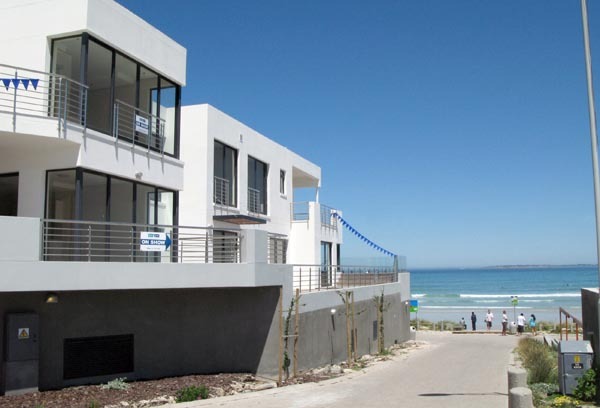 Situated 30 km’s from Cape Town in Melkbosstrand it is adjacent to the Atlantic Ocean – out the front gate, cross a road and a short stroll and you are on the beach. 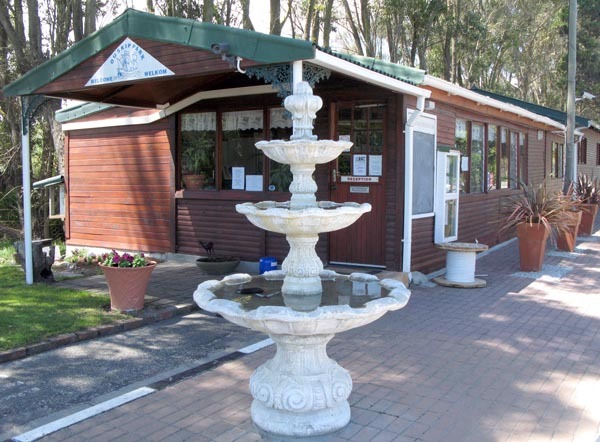 One of the big differences with this park is that there are about 300 people that stay there on a semi permanent basis and yet there are still over 200 caravan and camping sites, all of which are grassed or have wood shavings and have electrical points, that are available to the public.There are also 12 fully equipped, self catering two bedroom chalets for hire. 24 hour manned security entrance to the park. Check in and Information Centre. Inside the check in centre. 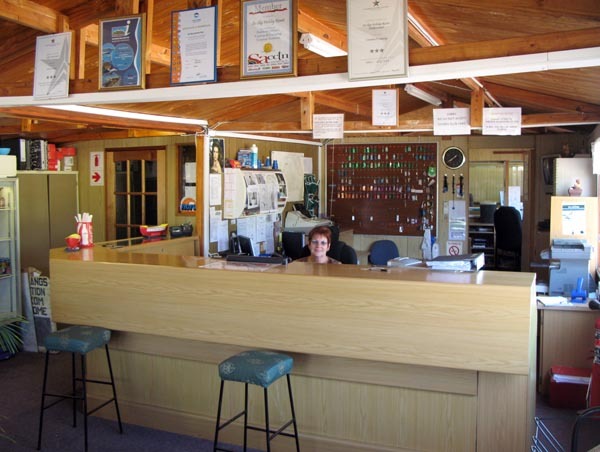 All the people that work in the centre stay in the park and are extremely efficient and helpful. 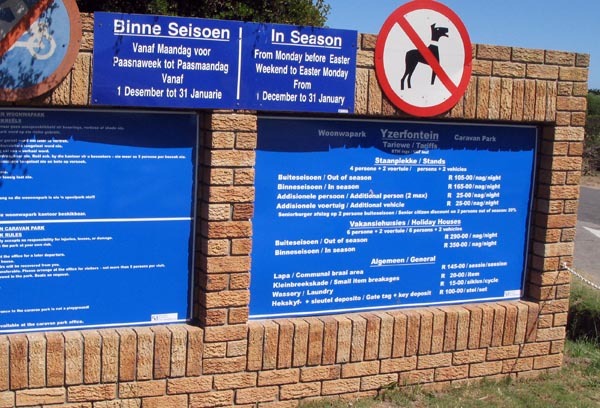 The park is really run as a business and there are strict rules as to what is allowed and what is not. 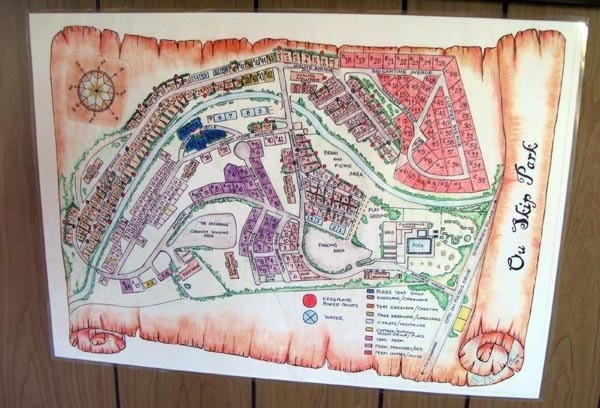 I took a drive round the area where the semi-permanents stay and some have obviously gone to a great deal of trouble to not only to make themselves comfortable but also to make their sites attractive. The best set up that I spotted. Probably about the same area as a 3 roomed flat. 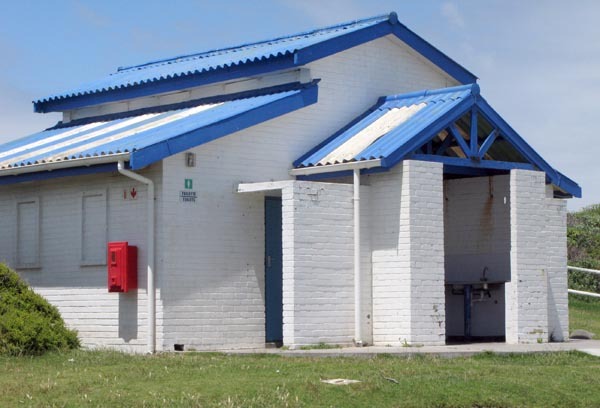 The whole park is serviced by 5 ablution blocks with hot and cold water, baths, showers and chemical toilets. 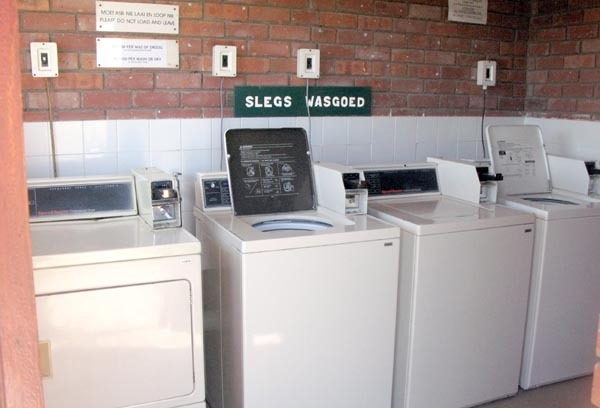 Scullery, laundry and ironing facilities are also available. There is also a propane gas refill and exchange station in the park. My set up at Ou Skip. To be honest most of the other sites had a better grass covering than mine. 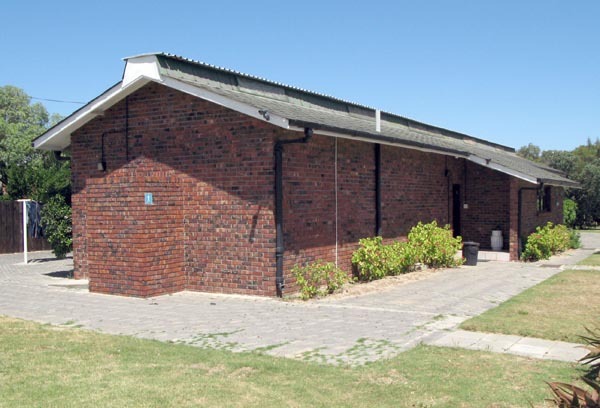 One of five ablution blocks. 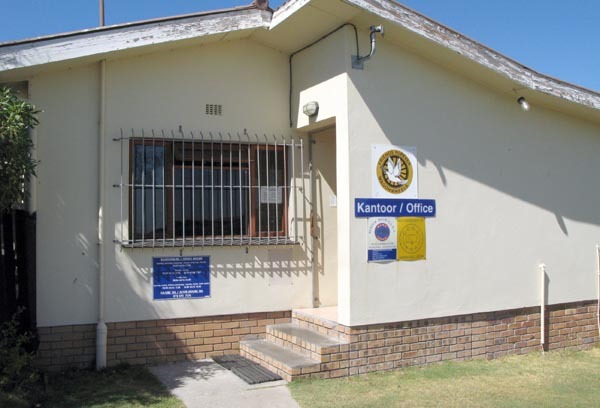 I found the ablution block that I used to be clean and well maintained. Laundry area. Clean and in good working order. The shop which operates over week-ends and durring the holidays. 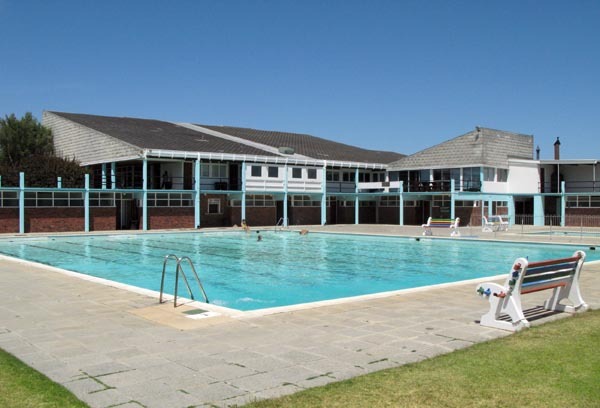 The half size Olympic swimming pool, with kiddies pool, is quite something. 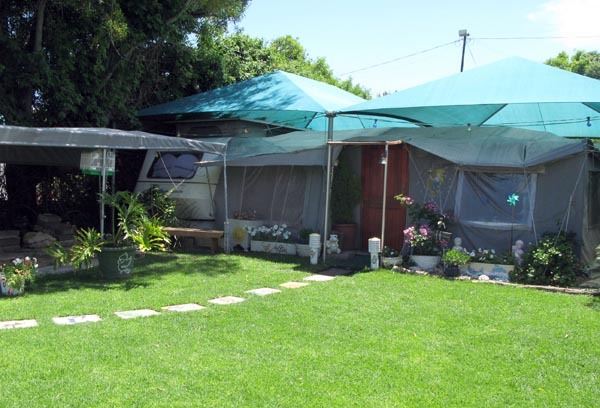 There is also a playground, badminton, volley ball, table tennis, darts, trampolines, DSTV, pool table, putt-putt, an entertainment hall as well as a small conference centre – max 25 people. 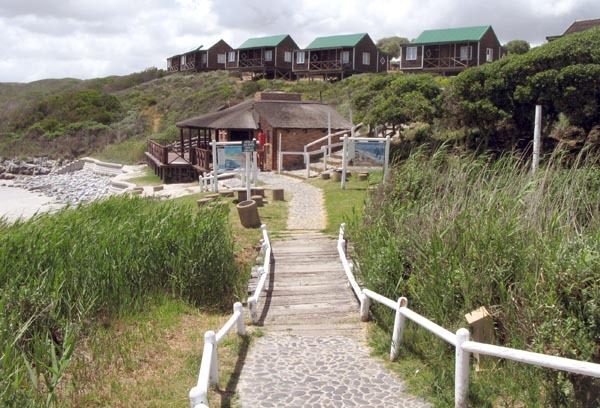 Close by to the park there is para-sailing, windsurfing, 4×4 trails, angling, hiking, paint ball and bird watching. 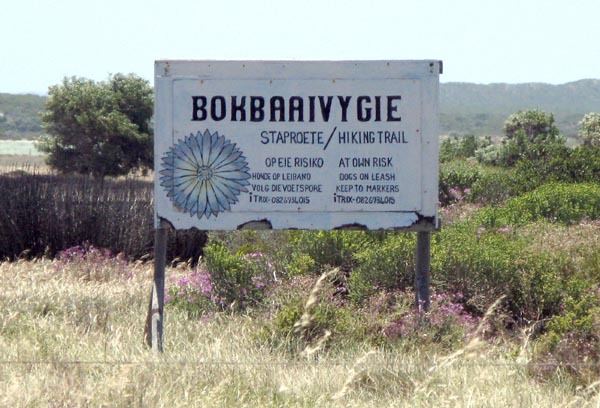 Just a few km’s to the north is the Koeberg Nature Reserve where there are 2 great hiking trails – the Grysbok Trail and the Dikkop Trail. 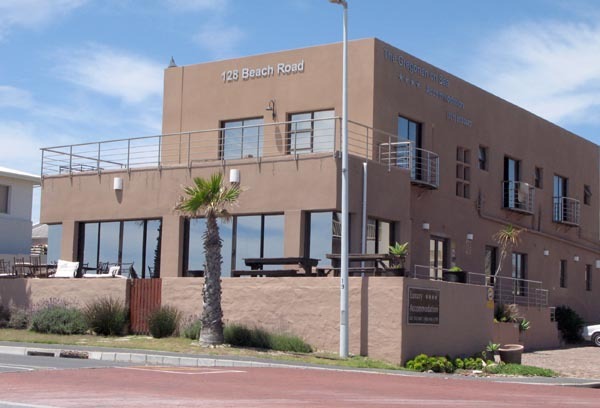 They are also only a street away from the fabulous Atlantic Beach Golf Club. 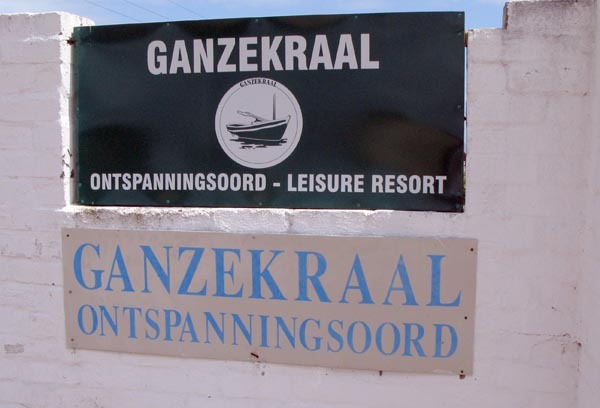 I suppose I should call it by the name on the info sheet I was given which is – Ganzekraal Holiday Resort and Conference Centre but I was mostly interested in the caravan park. I have heard and read so many conflicting reports on the place that I was keen to have a look round and see if I should spend a few days there. 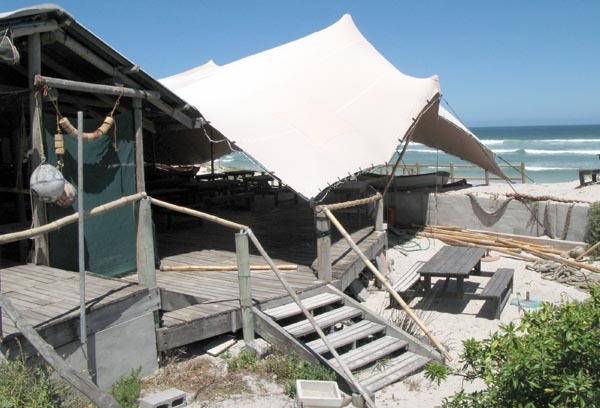 Ganzekraal is situated just off the R27 from Cape Town, about 20km’s from where I was staying at Yzerfontein, so I decided to take a drive and go and have a look round and see if it was really as bad as some people had said it was. The security lady was pretty friendly and gave me all the info sheets with prices and terms but did tell me that I had only 20 minutes to have a look around. I presume the reason for that was that she saw the fishing rods in the Pajero and they charge an entrance fee if you just want to go in and fish. A site virtually on the rocks. From the looks of the ground a popular site. 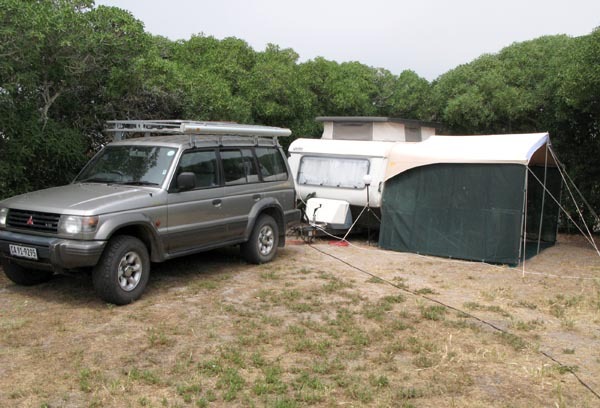 The camping area is divided into 2 sections – a lower section very close to the rocks and an upper section which is a bit further back and higher but gives you a really nice sea view. Lower section with nicely grassed stands. 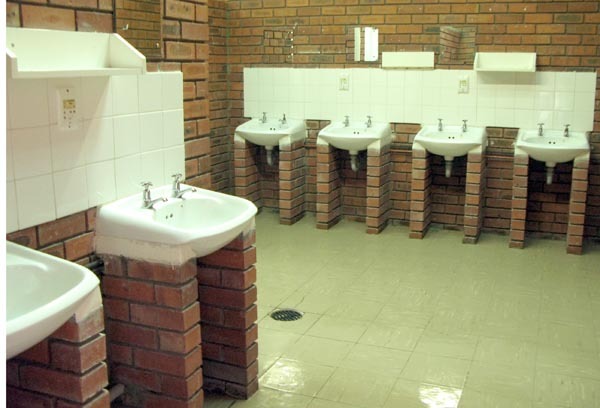 To be honest the facilities were not great here but looked much neater and cleaner in the upper section block. Stands on the upper section. One of the big problems is that there are no trees or bushes to offer any kind of shelter from the sun and wind and boy was it blowing the day I was there. 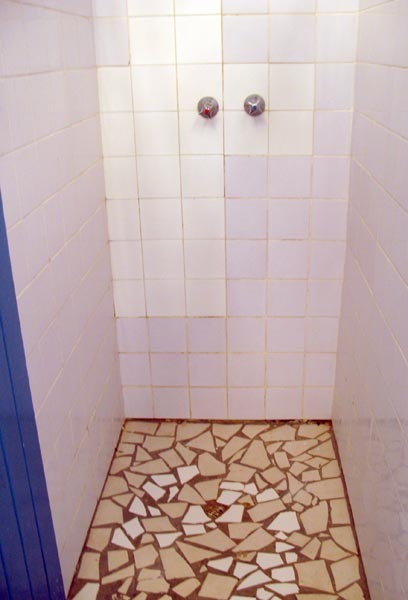 One of the showers in the upper ablution block. As you can see not bad at all and they have obviously done some maintenance work. Overall I thought the park did not look that bad but I sure would not like to be staying there when the wind is blowing. The one thing which I was told, and this was confirmed by all I spoke to, was to avoid staying there over weekends as the place gets packed out, is very noisy, has a rowdy element and is not very pleasant. I also thought the pricing pretty steep at R120.00 in and R115.00 out of season and no pensioners discount. That and the wind factor put me off wanting to spend a few week days there. Couldn’t have a look round as it was all locked up. One of the chalets that are available. 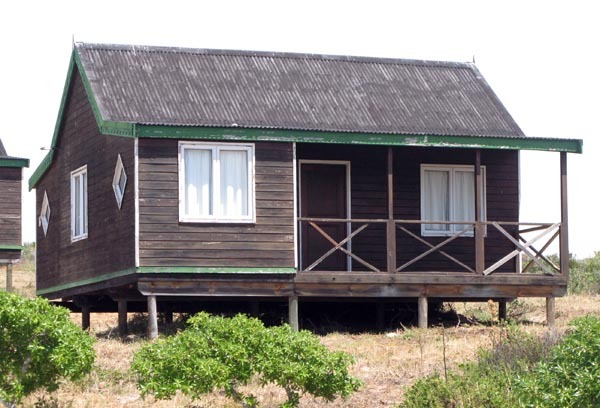 There are three different prices for the various chalets that all sleep six ranging from, in season, R490.00 to R610.00 per night. Some looked really nice while others, like the one above, appear to be a bit run down. Walk way down to the beach. One of a few fishermen I saw trying his luck off the beach. 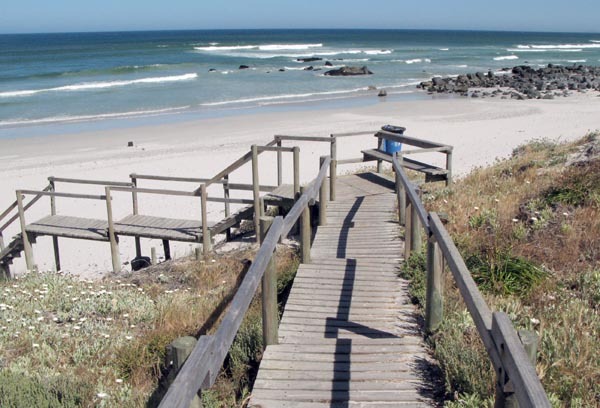 To be honest I was quite tempted to spend a few days here as it has a rugged charm about it but unfortunately the day I moved down from Yzerfontein was really hot and windy so gave it a miss and drove on down to Melkbosstrand. 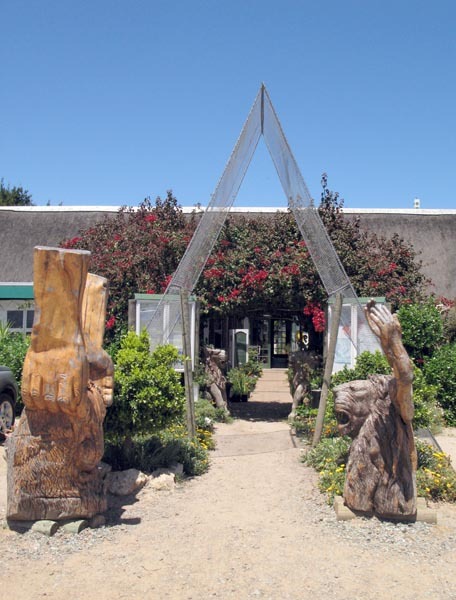 As one takes the turn off from the R27 down to Yzerfontein there are a few interesting places to stop and have a look around. I had travelled up and down the road a few times and been intrigued by the names and look of some of these places so determined to have a wander around and explore. 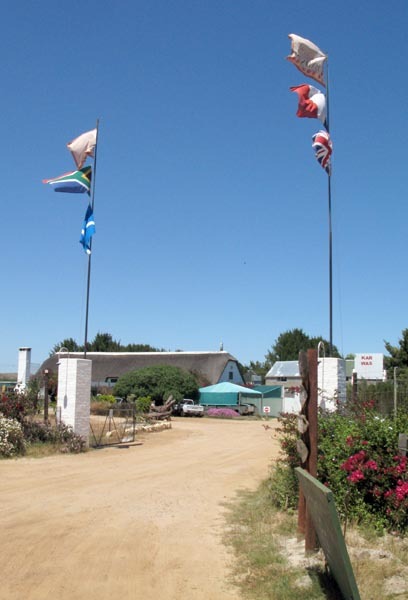 The first place, as you turn off the R27, is The West Coast Farm Stall (Weskus Padstaal). 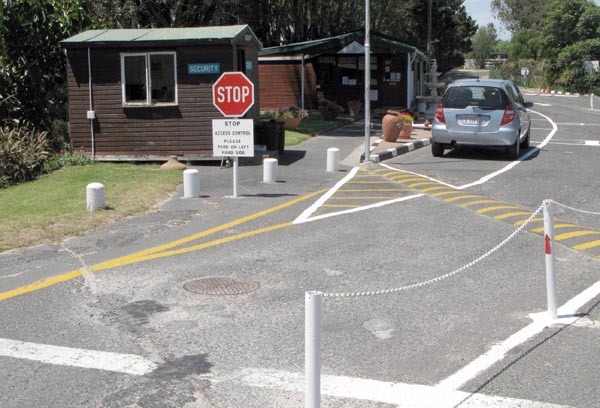 Entrance to the farm stall. 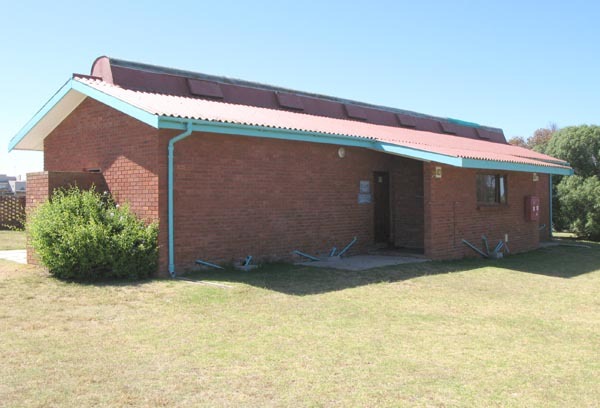 The new owners moved down from Mafikeng, in the North West Province where they had run a game farm, and took over the West Coast Farm Stall (Die Weskus Padstaal) in February 2009. 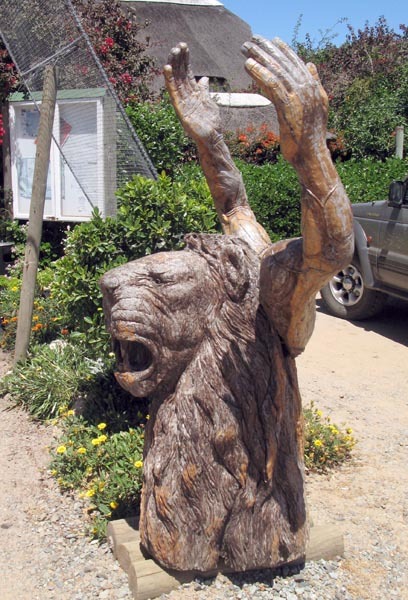 They had a man working for them who does these amazing carvings from tree trunks and branches and have brought many of them down as décor for the farm stall. Part of the outside garden area. One of the many colourful birds that can be viewed at the back of the stall. 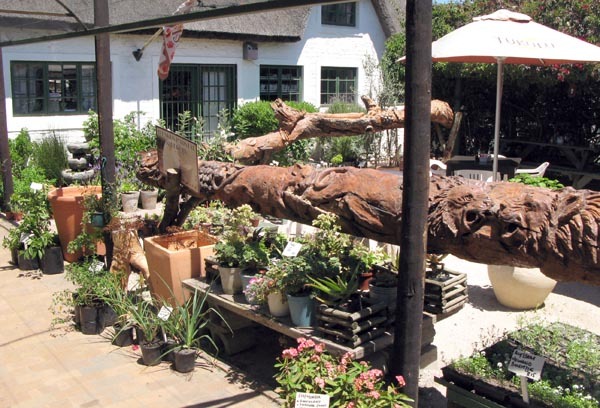 The farm stall is a really interesting place to make a stop and buy fresh bread, jams, honey, pies, milk, herbs etc. and also have a delicious farm style meal. 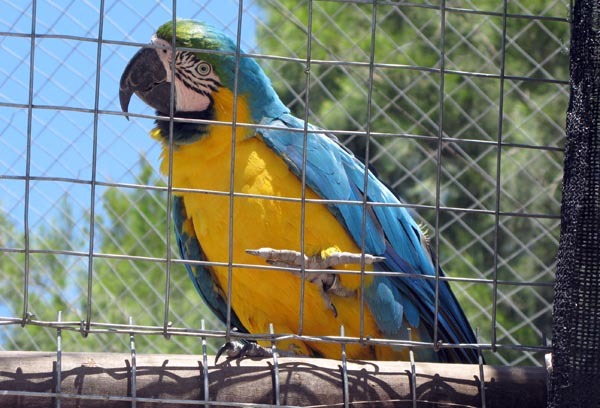 Apart from having a look at the wonderful carvings there is also huge aviary at the back with a wonderful collection of birds and, for a small fee, you can go on a guided tour. A bit further down the road are 2 Lime Kilns. In the days of the Dutch Est India Trading Company there was no cement available for building so these kilns were built to burn mussel shells to form a binding material which was then used in place of cement. 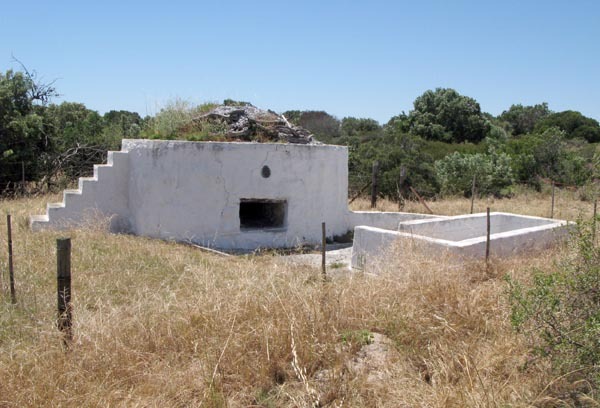 There is also a scale model of a kiln in Yzerfontein where one can read and see how they worked. I did take a drive down to the Lodge but there was no one there to chat to and get information. If you are interested just give the number on the board a call. 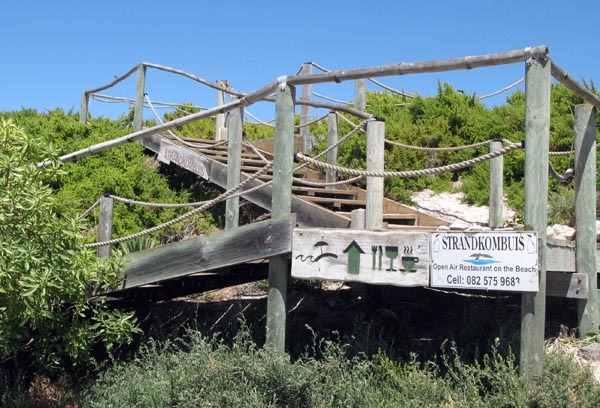 Not too long ago there was a road directly from Yzerfontein to the Strandkombuis but that has now been closed and you have to turn off the road about 3 km’s out of town and take a 6 km drive, round the salt pan, to get there. 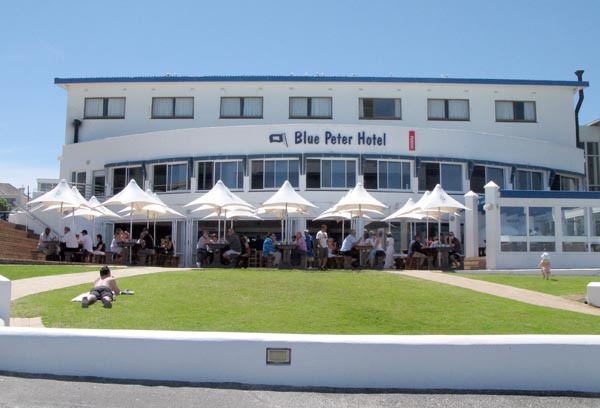 The restaurant is run by the Sandpiper Guest House which is close by. There was a beach wedding and reception taking place the following day. Found this on the beach in front of the restaurant but have no idea what it could be. 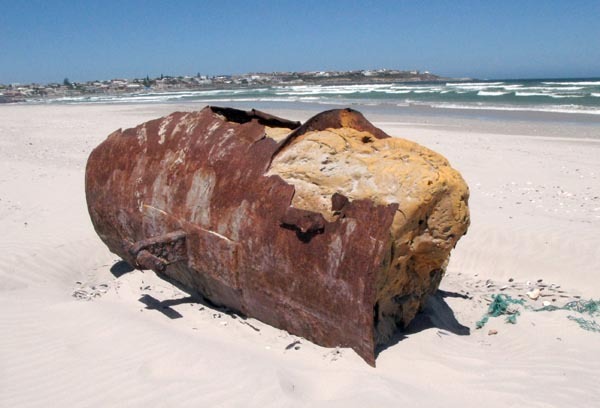 The photo does give you an idea as to how close the place is to Yzerfontein in the background. 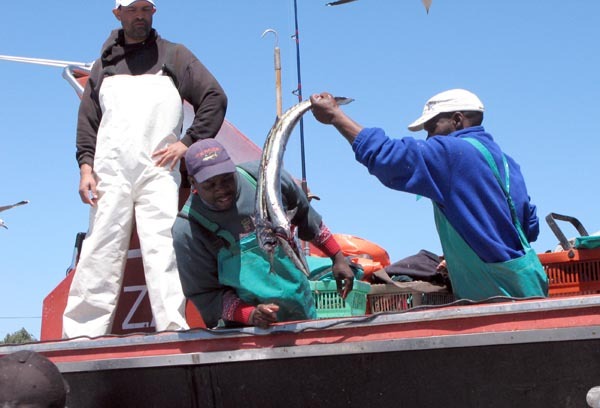 No fish can be sold or off loaded in the harbour area so as soon as the boats are out the water they head straight for the market, which is about 2 km’s out of town, where the buyers are waiting. 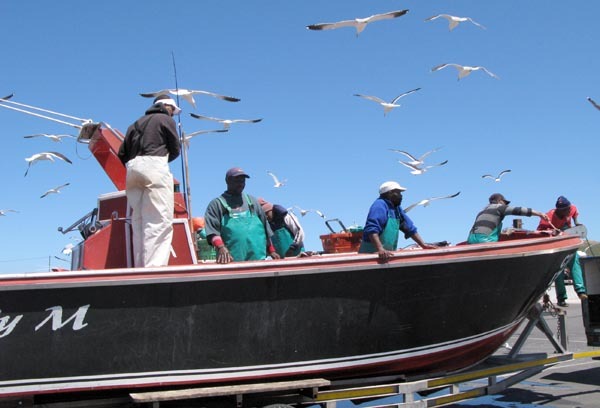 There prices are agreed and fish offloaded. There are also good facilities for washing and cleaning the boats. 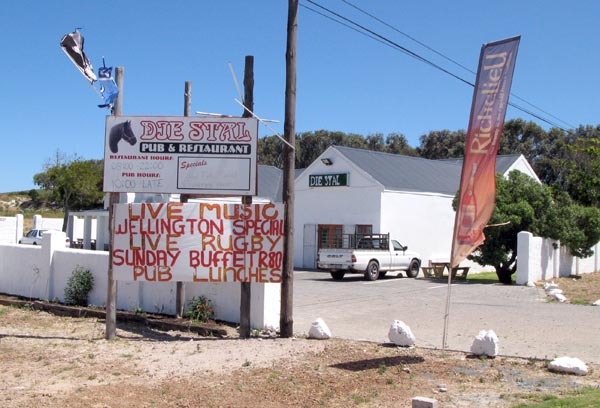 Die Stal Pub and Restaurant. 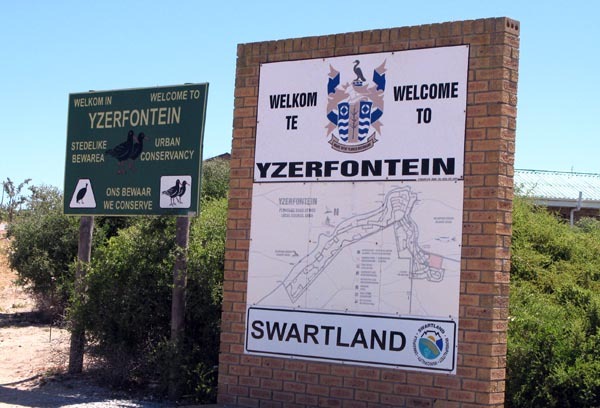 Hope you enjoyed the trip down from the R27 to the great seaside town of Yzerfontein. 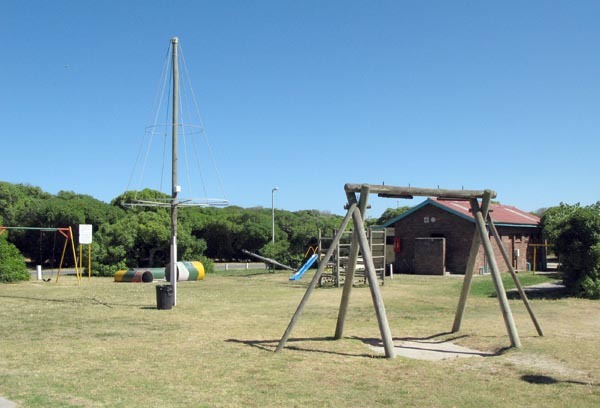 This was the second time that I have stayed at the Yzerfontein Caravan Park and to be honest it has become one of my favourites, not only the park but also Yzerfontein itself. The management and maintenance of the park is good and if I had to fault anything it would be that some of the less used sites have become a bit over-grown and shabby. During the week the park was fairly empty but over the two week-ends I spent there it was about 95% full and because I had no booking I ended up on one of the not so good sites. 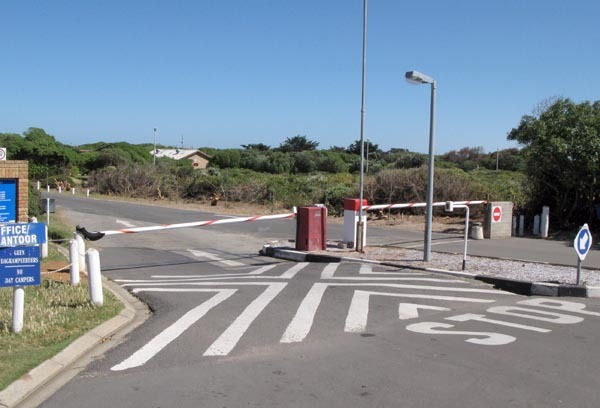 Security entrance to Yzerfontein Caravan Park. Very efficient and friendly service at the office. My set-up on site 35. 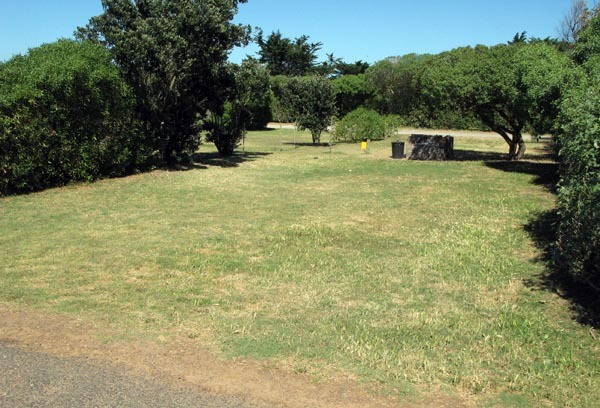 As you can see the ground cover (compared to many of the other sites) is not great but the best thing about this park is the way each site has trees and bushes to protect you from the wind and also afford privacy. Even with a 95% occupancy rate over the week-ends it never felt crowded. 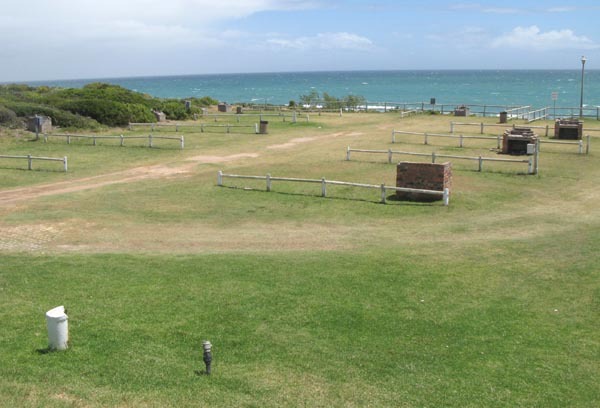 One of the many well grassed and sheltered sites. Management is in the process of upgrading the electrical connection units and compared to many of connections I have seen at other parks these are great. 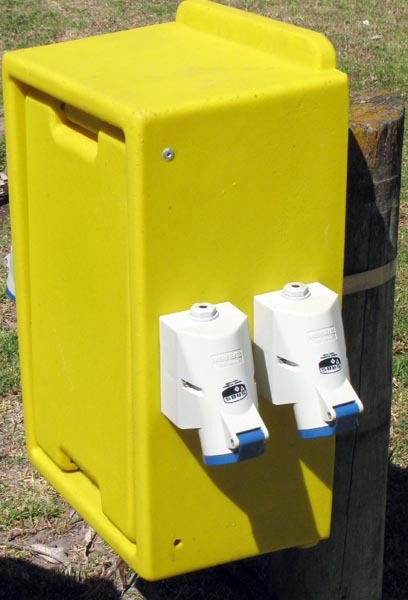 There are 4 ablution blocks and you are given a key for the one closest to your site. I found the ablutions clean and well maintained. 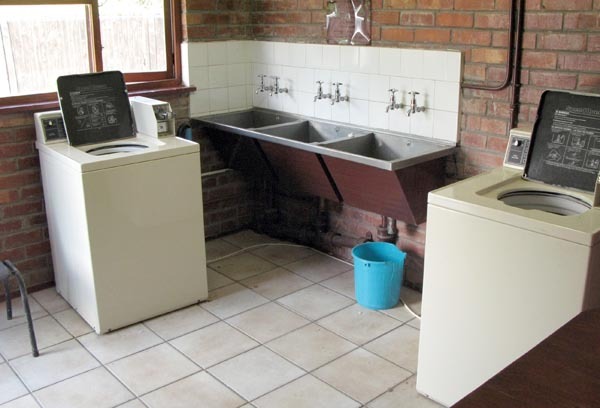 Washing machines and a tumble dryer available. Some facilities for kids but these could be improved. 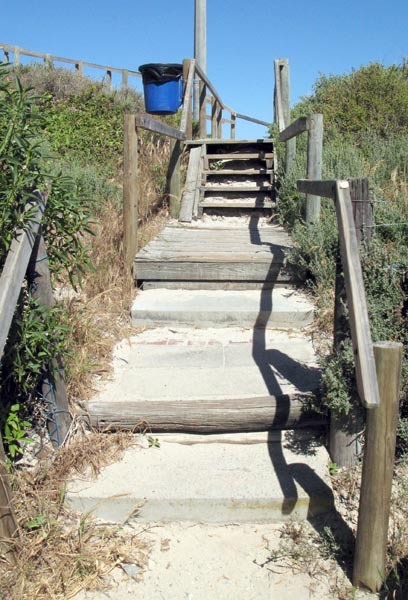 Although the park is situated right next to the beach one has to go over some steps to get to it. While it would be great to have a view of the ocean the dunes provide fantastic shelter from the wind. View from the top of the stairs. 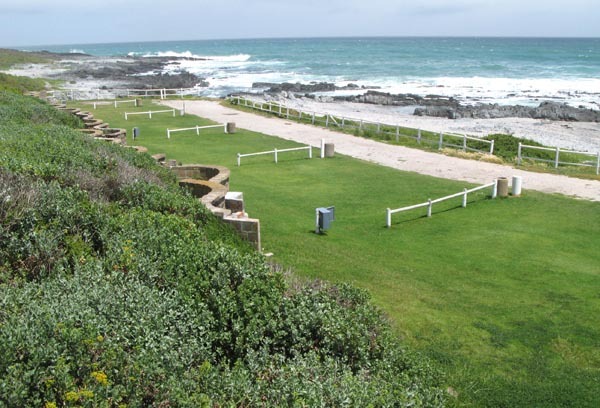 All in all I can understand why this is such a popular caravan park as the facilities are good, Yzerfontein is a great place with a blue flag beach and it is only an hours drive from Cape Town. 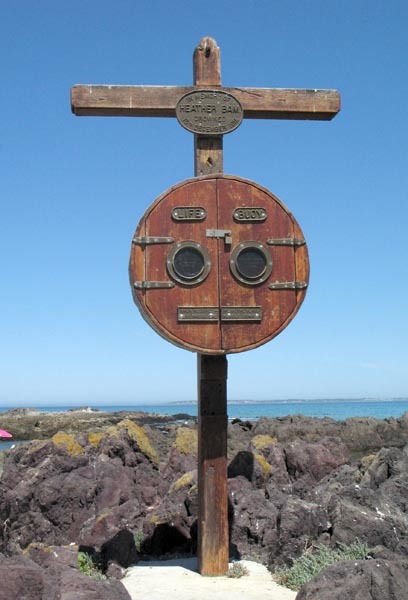 If you are thinking of trying camping or caravanning for the first time this would be a great place to give it a go. This was the case for my neighbours on the first week-end I was there and they loved it. 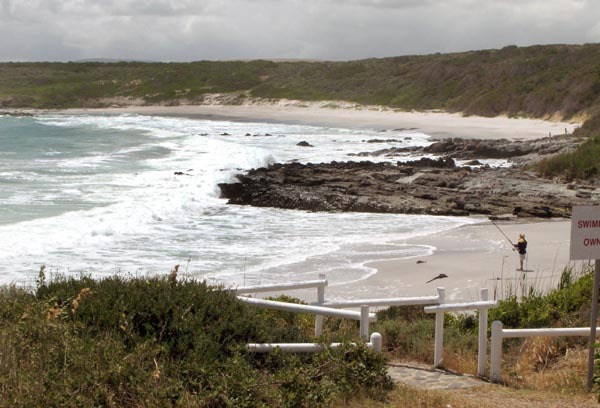 Kleinbaai & Danger Point Lighthouse. 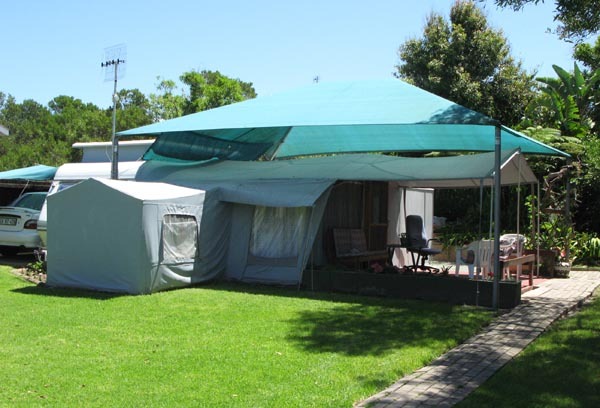 Paradise & Onrus Caravan Parks. Tony on Britannia Bay & Shelly Point. © 2010 Gone Fishing. All Rights Reserved. Website by the Forge Web Creations - Cape Town Web Designers. No content may be re-used or redistributed without the permission of the author.